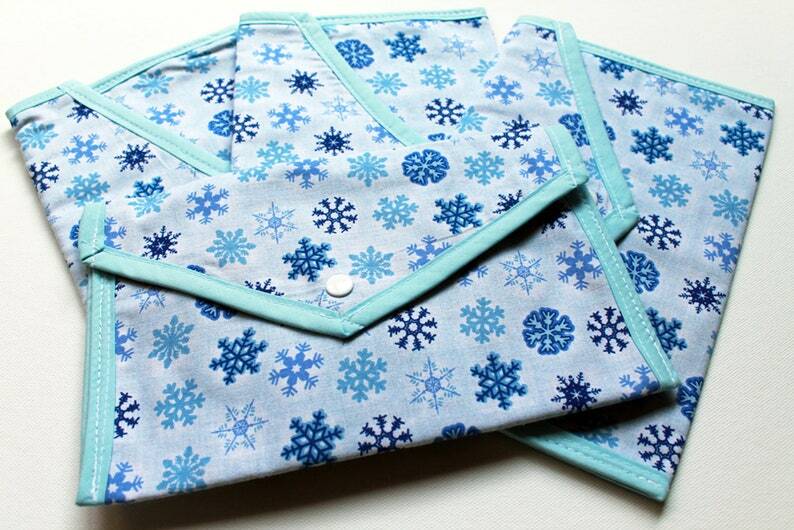 Made using a beautiful snowflake print in blue and white, finished with light blue bias tape and a white snap fastening. The pouch can be used to store a variety of items, from small hand held electronics to paint brushes and pens. If you have any more questions about this item or anything in my store, feel free to send me a message. Really impressive work. Plus, she didn't get charged as much as expected by the post so she transferred the saving back to me!!! Item arrived in a reasonable time and was as described. All Paypal and Credit Card payments should be made within 24-48 hours of placing an order. If you're waiting for funds to transfer via Paypal, please let me know via convo or e-mail. If payment is not made before the 48 hour period I will be forced to cancel the sale. NO orders are sent without payment having been received first. Currently I do not offer refunds or exchanges on any of my custom made items, but if you do have an issue please contact me. Please ensure that all sizes and measurements given are correct. Any refunds that agreed by both parties will be processed once the item has been returned to me in its original condition. Please note that the shipping cost is non refundable. I ship to the address given on PayPal. Please make sure your address is correct. If you want the item shipped to a different address please contact me before purchasing an item. For ready made items I aim to have the item shipped same day as purchased (if possible), otherwise I ship it out the next day. For custom made items the processing time will vary, please look at the shipping section on the listing. Shipping within the UK is via 1st Class Royal Mail, which usually takes about 1-2 working days after the item has been sent. All Non UK orders are shipped via Airmail. Please note that your items could take up to 4 weeks to arrive. The buyer is responsible for paying all duty and customs fees where applicable. I cannot be held responsible for any items damaged in the post. BUT I will be happy to try and fix the item if it is fixable, or I shall replace it.